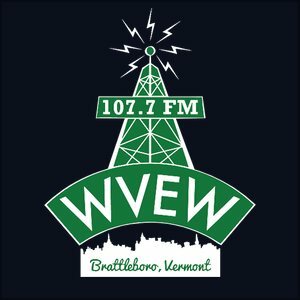 The Brattleboro Selectboard sent an approved FY20 budget to Representative Town Meeting as part of the annual Representative Town Meeting Warning. Representatives from the arts community, meanwhile, asked that an article requesting 2% of the Rooms & Meals tax be allocated for an Arts Fund for public arts projects, $8,424, be placed on the Representative Town Meeting Warning. The board said no, telling them it was hasty and didn’t have enough detail. 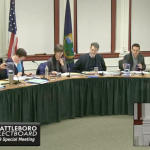 The Brattleboro Selectboard will hold a special meeting on Tuesday, January 29, 2019, in the Selectboard Meeting Room at the Municipal Center. It is anticipated that the Board will enter into executive session at 6:00pm to discuss the employment or evaluation of a public officer or employee. The Board will reconvene the business meeting at 6:15pm. ASL interpreters will be available for deaf and hard-of-hearing community members. The Brattleboro Selectboard faced multiple groups of unhappy citizens at Tuesday evening’s meeting. Unhappy about inspection fees, unhappy about local option sales tax, unhappy about, well… lots of things. It was around nine o’clock when the board got to their first item of regular business. Yes, one of those meetings. Has anyone else found that the ink on the purple PAYT bags is coming off on your hands? I bought some at Hannafords recently and noticed my hands were black after taking out the trash. I took a close look at the bags and the ink is visibly falling off. NOTICE is hereby given that the Brattleboro Town and Town School District Auditors’ Reports for fiscal year ending June 30, 2018, are available upon request and may be picked up at the Brattleboro Town Clerk’s office, 230 Main Street, Brattleboro, Vermont. The Auditors’ Reports will also be available as part of the Town and School District Annual Report which will be available at the Town Clerk’s office no later than February 22, 2019. 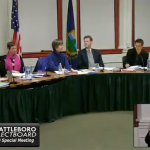 The first meeting of the Brattleboro Selectboard in 2019. Read on for discussions of the FY20 budget, spending 10% of the Rooms & Meals tax for promotion, changes to the parking system, Police and Fire facilities matters (including a new carport) and home rule potential. The Brattleboro Representative Town Meeting Finance Committee will meet on Thursday, January 10, 2019 at 5:30pm, in the Cusick Conference Room (2ndfloor) at the Windham Regional Career Center, located at 80 Atwood Street. Dozer the (Maybe) Dangerous Dog will be one of the first things the Brattleboro Selectboard takes up in the New Year, unless an agreement is reached prior to Tuesday’s meeting. The Police Chief plans to bring additional witnesses and evidence. The board will also take up other big issues, such as remaining work on the Police-Fire Facilities project, the FY20 budget, changes to parking, and a Municipal Self Governance Proposal from the Vermont league of Cities and Towns. You may continue to bring up other items not on the agenda during public participation in 2019, as in past years. Brattleboro Town offices will close at 12:00pm on Monday, December 24, and will be closed on Tuesday, December 25, 2018, with the exception of emergency services. Brooks Memorial Library will close at 12:00pm on Monday, December 24, and will be closed on Tuesday, December 25, 2018. 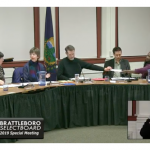 The Brattleboro Selectboard took up FY18, FY20, financial audits, Whetstone hydrology, and many, many grants as part of their final meeting of 2018. January scheduling was also an issue that was resolved, sort of. Hydrologic and hydraulic matters will be on the agenda at the next meeting of the Brattleboro Selectboard. It’s all part of the Tri-Park Housing Cooperative Master Plan. The board will review FY18 finances, discuss FY20 budget final steps, and approve a number of grants. You can participate, of course, and bring up other itmes not on the agenda during public participation. 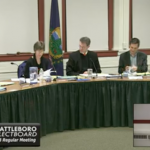 The Brattleboro Energy Committee will hold a special meeting and energy forum on Monday, December 17, 2018 at 5:30pm in the Selectboard Meeting Room at the Municipal Center. The Brattleboro Traffic Safety Committee will meet on Thursday, December 20, 2018 at 8:00am in the Selectboard Meeting Room at the Municipal Center.